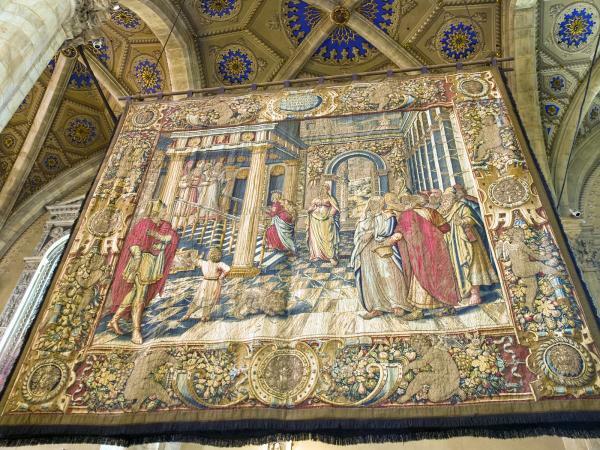 Since early medieval European times tapestry's major purpose has been well-established as the making of large pictorial wall hangings. This use of a 3000-year-old textile structure has been held as standard, particularly in western society, right through to the twentieth and twenty-first centuries. Out of central Asia and over many centuries the kilim rug, using the same woven structure, has established a highly respected role as a religious, decorative or a simply functional floor covering, and domestic application abounds in the modern world. One should recognize, too, tapestry as an upholstery fabric for chairs and sofas, not an inconsiderable application in the eighteenth, nineteenth, and into the twentieth century. However, as recently as the late 1990s, the discovery of woven garments in burial sites in a remote area of central Asia-garments with extensive use of woven tapestry as part of their construction-further identifies what can be argued as tapestry's widest application over world history: tapestry as clothing. These particular garments date from between 200 B.C.E. and 200 C.E. and were unearthed from sites in the remote town of Shanpula, once part of the ancient southern silk route. They are woolen skirts and have graphic pictorial bands as inserts, set horizontally around the entire circumference and range between 2 to 8 inches (5 to 20 cms) high. When considered alongside the use of tapestry in the woven tunics of Coptic Egypt, in the application of diverse items of clothing in pre-Columbian Peru and the knowledge of Chinese Kessi or silken tapestry robes, there is reason to believe that this medium had a wide purpose beyond that of creating wall hangings. This is not in any way to diminish the richest of history of the mural tapestry; rather, it is to recognize that the evidence we have of dry desert-like conditions (Egypt, coastal Peru and the Mongolian region) having preserved such clothing, this application could have been even more widespread in less protective climates. In Egypt, roughly between 300 to 800 C.E., the Copts, a Christian sect in that country, are known for the application tapestry to clothing. This process was employed particularly in the construction of linen cloth garments where passages of colored wool and undyed linen tapestry were woven as an integral part of the plain all linen cloth in the form of roundels, rectangles and vertical bands. Such garments, simple rectangular sleeved tunics, were clearly in regular use. As wear took place on more vulnerable areas of the plain linen cloth, the tapestry passages, with their highly evolved, sophisticated and complex imagery, would be cut out and patched onto entirely new plain woven tunics. That they were subsequently used as burial garments after frequent daily use suggests that such tunics were of significant value to the wearer. There is also strong argument to suggest that this developed skill of woven tapestry, which was also employed in complex wall hangings in religious and ceremonial architecture in Egypt, has direct links to the emergence of the large mural tapestries in northern and western early medieval Europe. However there is little or no evidence to suggest that tapestry as clothing made this northern journey. In South America, particularly in the coastal and western Andes region that is now Peru, and during the period between 200 B.C.E. and 1600 C.E., tapestry vestments were clearly widespread in use. These were short, square, sleeveless tunics of a seemingly military, almost heraldic appearance. They were often of an entirely tapestry construction, sometimes of simple contrasting checkers or of an extremely evolved figurative iconography which could be seen as complex pattern to the less experienced viewer. The range of application was for domestic, ceremonial, regal, military or symbolic use, for identifying groups of individuals and as burial clothing. They were used as tunics, mantles, masks, hats, belts, shrouds, shoes, even gloves. And the technical skills employed in the weaving were of the highest order, of great inventiveness and on a level that is hardly understood, let alone practiced in the early twenty-first century. Given the extensive history here described, it is surprising that in the early twenty-first century and particularly in the world of high fashion, tapestry has virtually no presence. There may have been brief individual experiments that never emerged to sufficient degree except to hint at a potentially rich vein of expression. One example may have been a gentleman's tapestry vest (waist-coat) worn by the designer that was made of complex pattern in black, gray, white and much silver metal. It was quite stunning but most often concealed behind a nondescript button jacket. In London two of the ancient guilds, that of the wax chandlers and the cappers and felter, in the 1960s and 1970s made ceremonial robes for their chief office bearers. Both garments were full length silk with quite extensive tapestry woven insets. The main dignitaries of London's Royal College of Art wore black silken robes. The collar, which is some 16 inches (40 cms) square and hangs down the wearer's back, depicts a stylized phoenix bird in sparkling gold metals, (the college symbol), while the robe's front facings fall all the way to the floor. These are wide, flame-like golden bands, even having extensions to fit the height of different dignitaries. Perhaps the nearest approach to tapestry as clothing in the western world emerged at the peak of medieval tapestry. Great skill and design was employed in illustrating the nature of the complex vestments of the individuals illustrated in that period. By the use of wool, linen, and silk the cloaks, robes, tunics, hats and hose imitated all fabrics and fashions of the relevant period. This practice was employed to such a degree that, if not otherwise known, the precise dates of the making of these tapestries can be established. The extremely labor intensive nature of this ancient craft-tapestry-makes it very costly cloth for the smallest areas. See also North Africa: History of Dress; South America: History of Dress; Byzantine Textiles; Chinese Textiles. Kybalova, Ludmila. Coptic Textiles. London: Paul Hamlyn, 1967. L. L. Editores. 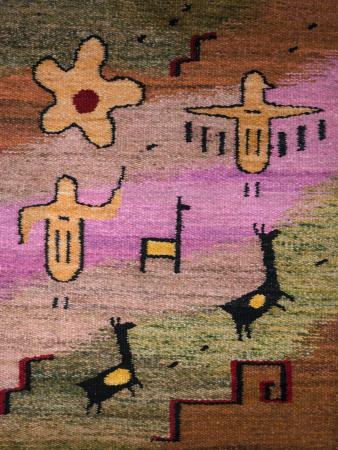 The Textile Art of Peru. Lima, Peru: Jiron A Miro Quesada Lima.